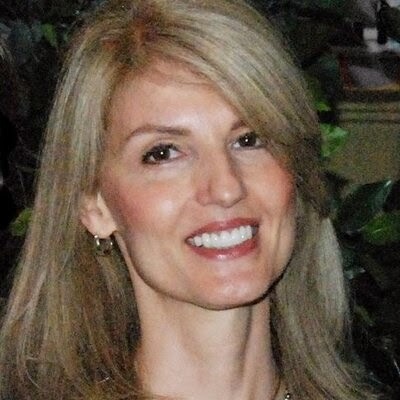 My oldest sister is an interior designer (don't get me started on the model home she once decorated with a French au pair suite and third floor office with a female mannequin toggling a cigar--wow! ), and her husband is an architect. I always thought it would be cool if one day they went into business together, sort of one-stop shopping for home-seekers. Maybe their son would become a builder and the business would be complete. 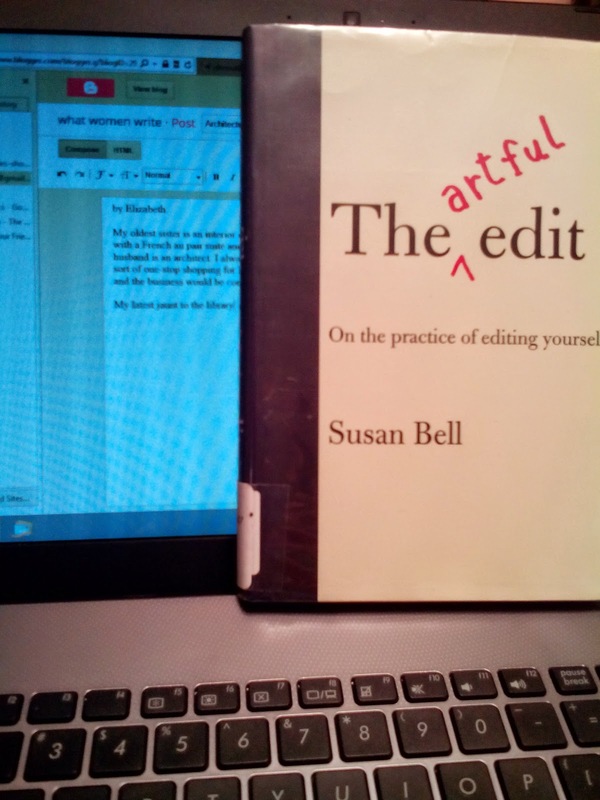 On my latest jaunt to the library, I scored a copy of The Artful Edit, Susan Bell's book coaching self-editing. I'm still reading, but already some of the ideas she introduces have made me think, and think hard. What a great resource, though: to be able to edit oneself. Not, of course, to eliminate the need for an editor, but to push a manuscript that much further along, and free up both the writer and the editor to achieve more because so much has already been achieved. Bell uses the example of The Great Gatsby and F. Scott Fitzgerald's relationship with his editor Max Perkins. (I'm pretty sure I recognized Perkins' name before perusing Bell's book in the stacks, but now I know I have to seek out another writer's work, Scott Berg, for his biography of Perkins.) I'm still early on in the book, but I have to say, it's heartening to know what went into that vaunted book, and what both writer and editor achieved in the process. So what does this have to do with my sister's family? My vocational vision for them popped into my head when I read these lines of Bell's: "If writing builds the house, nothing but revision will complete it. One writer needs to be two carpenters: a builder with mettle, and a finisher with slow hands." A plan for a manuscript is one thing; a first draft another altogether; and a book? A novel? It is far, far more than a draft, much more like a furnished house complete with curtains and dishes and pictures on the walls. As for the clutter that makes it a home, newspapers on the breakfast table and food in the fridge? That is what the reader brings, I suppose. But if the writer himself can both build and decorate, and then turn to the editor, how much more efficient? How much more true? My current MS is now in the hands of a fourth beta reader, and even as she reads through it, my mind is busy with the ideas Bell has introduced (or maybe just reinforced?). Sure, I'm counting on my critique partners, but having confidence in myself, and acquiring the tools to justify that confidence--that's even better. My girl asked me the other day, when I was a kid, what did I want to be. I remember my little self wanting to be a vet. I loved animals and still do, but when I learned about euthanasia, I changed my mind. Then, a fascination with the show Quincy, M.E. (starring Jack Klugman) gave me a brief aspiration to become a medical examiner. Then the thought of having to autopsy a child hit me, and that dream vanished, too. I still had a love of science, so I started college as a pre-pharmacy major. During my sophomore year, I decided spending my life behind a counter didn't sound too thrilling (and I was struggling with my anatomy class), so I changed majors to marketing. I didn't really plan to be a writer; rather the career found me. And now that I am, I realize how much my work affects my daily life; maybe yours too. You might not be the most poetic person in the room but you can't help staring at the burning sunset or watching two ambitious lizards wrangle a moth. 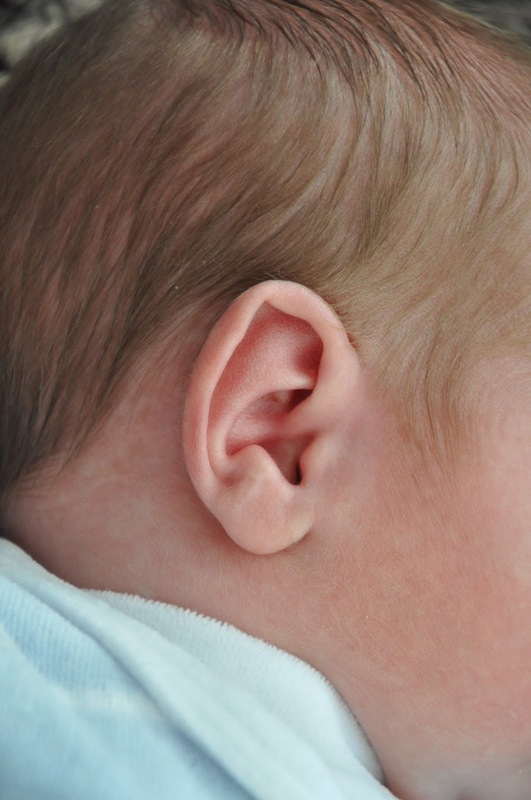 You marvel at a baby's velvet ear or prefer a midsummer thunderstorm over a fireworks display. While the rest of the world stares at their phone screens, you prefer to watch the awkward college student attempt to talk to the pretty girl at the ballgame. 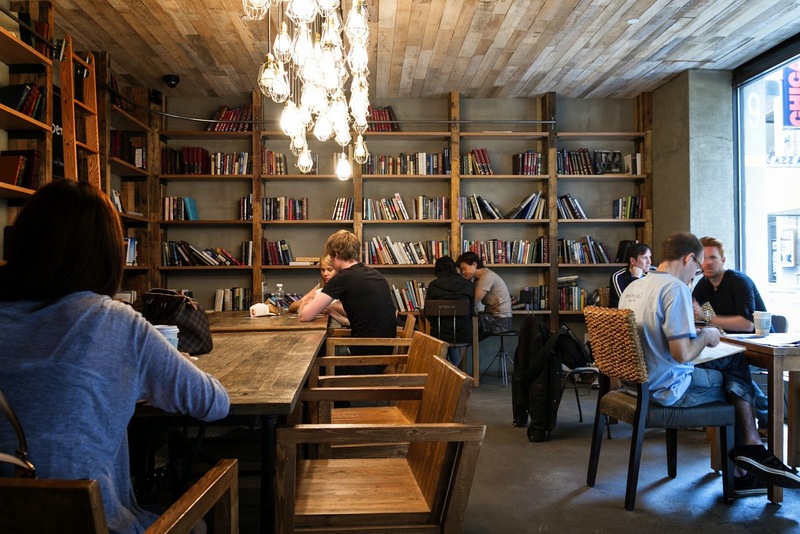 If you're not working, you choose the table at the coffee shop nearest to the most eccentric-looking customers in hopes of overhearing some conversation. My girl has recently taken to heart the phrase: You learn something new every day. And so she'll often ask me at night, "What did you learn today?" I nearly always have something to contribute. I know I'll never learn all there is to know about writing and have marveled at times that anything I wrote 10 years ago was even fit for public consumption. Part of your writing style is intuitive. You can't deny a certain giftedness you must possess. But I know I depend on my AP Stylebook to help me with an issue at least once every other week. I learn new words all the time--and then forget half of them, so they're 'new' again the next time we cross paths. I still can't explain to you what 'close third' is in POV even though it's been explained to me a few times. If you're reading, you're learning about writing. If you're writing, you're also learning by trial and error. Never stop learning ... that would mean you've either given up on writing or died. Either would make me sad. When I moved to Texas nine years ago, I knew four people in my town ... and I'm related to all of them. It didn't take long before my homebodied-self ventured out to the library to take a class on writing taught by two authors--Britta Coleman and Candace Havens. At that class, I met a couple writers (who I still connect with via Facebook). From there I drove across uncharted freeways to Richardson Library for another gathering of writers and met Joan and Kim. (Best move EVER!!) It's amazing the number of people you meet while writing if you get out and explore. Visit writing groups, find a critique group, attend author signings, go to writing conferences. Sure you can discover a wealth of resources online, but making yourself reach out to like-minded individuals can keep you from giving up when the going gets rough. And who hasn't felt the urge to find a creative outlet that's less taxing on the ego? These are just a few ways writing has changed me. How about you? 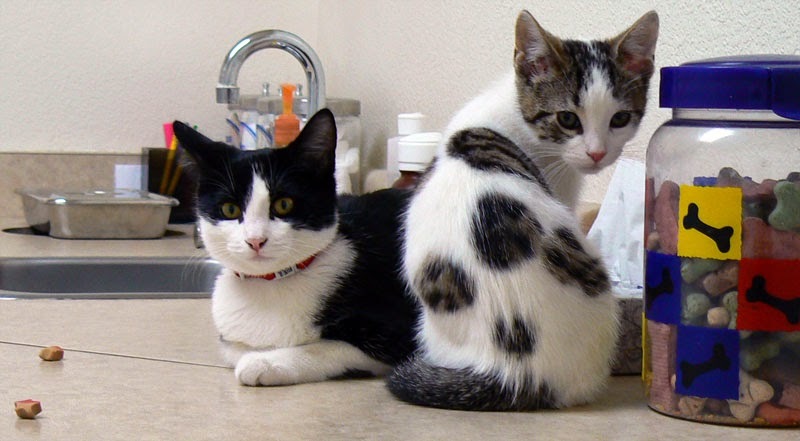 Flickr images of: 'cats at the vet' by Kami Jo; 'baby ear' by Tilman Zitzmann; 'coffee shop patrons' by Neo_II. Without further ado, here are my responses. I can’t say I’m accomplishing much at the moment beyond playing chauffeur for my kids, but summer will end on Monday and my temporary hiatus from writing will be over. When I do have a few moments to myself I plug away at a rewrite of my historical novel, tentatively titled The Oak Lovers. Consistent feedback from agents convinced me my story would be best served by changing it from two viewpoints to just the one. As many of our regular readers know, The Oak Lovers is the story of Madonna Niles, a gifted young artist who flees her morally rigid home in the summer of 1900 to join Roycroft, an art colony in Western New York. A chance encounter with landscape painter Carl Ahrens, a striking and worldly older man, draws Madonna into an exhilarating web of creative obsession and forbidden love. When Madonna is faced not only with the devastating reality of Carl’s tuberculosis, but also that he lives at the mercy of a wife who insists prayer will cure him, she must make a choice: abandon the man she adores for the sake of her own artistic ambitions, or shoulder the burden of his survival in a world that would forever be set against them. Many historical novels are written about familiar figures from the past, household names like Van Gogh or Napoleon or Frank Lloyd Wright. My novel features an artist who was considered a master in his lifetime but has been overlooked since. This prospect is both a blessing and a curse. On the one hand, I have a story that hasn't been told before about an artist who deserves to take his rightful place in history. On the other, I have to convince an agent and publisher to take a chance on marketing a novel about a painter who, though larger-than-life, will have only a modest built-in audience. I have to trust that in the end it is all about the story and that the book will eventually find a home. My answer boils down to one word. Love. Love for the idea of soul-mates. Love for a grandmother taken before I had the chance to know her. Love for the sound of native drums and the smell of sweetgrass. Love for a foreign land that has become my soul’s home. Love for the joyful cobalt blue dabs in most of my great-grandfather Carl’s paintings. Love for a story that is in my blood, a story only I can tell. It was love that led me to attend a writers’ conference in Austin, Texas, several years ago in order to pitch a biography called Knight of the Brush. The subject was a certain Canadian painter. Agents listened kindly to my clumsily delivered spiel, some even invited me to send my proposal, but I sense most lost interest as soon as I mentioned my connection to Carl. Put Bullock at the bottom of the slush pile I imagined them saying to themselves. An editor told me big publishers would never buy an artist’s biography unless his name was Monet or Degas—something recognizable. She suggested I approach a small university press in Canada, preferably from Carl’s hometown. Undaunted, love led me to build a website featuring Carl’s best and brightest work, paintings that disprove his reputation as a “dark tree painter.” The president of the Waterloo Historical Society (Ontario) found the site and asked me to contribute an article about their native son for the Society’s annual volume. The “little something” turned into a 6,000 word cover story and an invitation to be the keynote speaker at that year’s launch, which was being dubbed Carl Ahrens Day. Two months later I did just that at the Kitchener Waterloo Art Gallery. 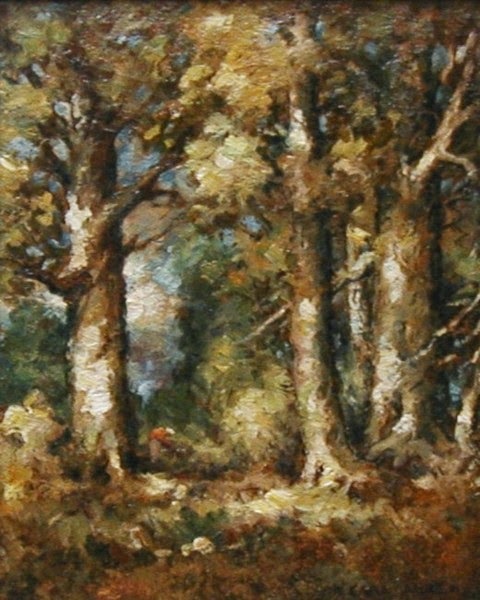 It was the first time in seventy years that a collection of Ahrens paintings had been exhibited to the public. Later that same year Carl shared the spotlight with Andre Lapine, one of his closest friends, at a second gallery. I spoke at the opening day, and have two more standing invitations to speak. Powerful enough for me to scrap the biography and tell Carl and Madonna’s story in a way that would bring them to life for everyone else as they have always been for me. Powerful enough for me to start over when my attempt to do so was not quite good enough. I have no choice. There’s a story in my blood, and I’m the only one who can tell it. I won’t lie. This book has taken a long time to write, partly because it began as narrative nonfiction and has become more fictionalized over multiple drafts. This latest version is more "based on" the lives of my great-grandparents than an attempt to write any sort of joint biography. The framework of their story remains in place, but since it is now all in her viewpoint the story arc has certainly had to change. I had to let go of a lot of things, little “darlings” that wouldn't matter to the average reader, but meant a lot to me. These changes had to come gradually. This is a difficult question to answer because my process for this book was different from what I used with my earlier novels, or what I will use with future ones. In general I get an idea, I research, and then I write a draft in anywhere from three to nine months. Then I revise and polish. The Oak Lovers took me about five years to have a complete draft because I edited as I went along. Any other story would not come with any outside pressure to “get it right.” I would not have family or art collectors waiting to read with any sort of expectations over what I will put in and what I will leave out. It is hard to write that way and I would have given up long ago if I didn't know I was meant to tell this story, if I didn't have faith that I’d eventually do it justice. And now I would like to tag C.G. “Chris” Blake to participate in the tour. 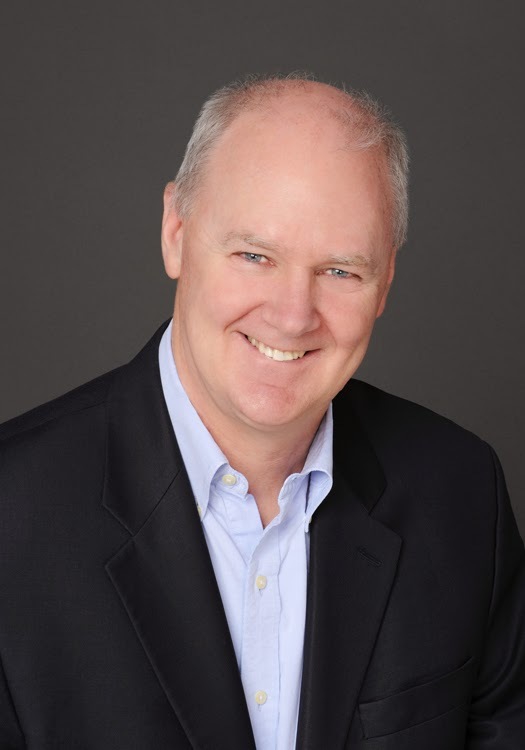 Blake is an author and editor with more than 30 years of experience as a journalist. 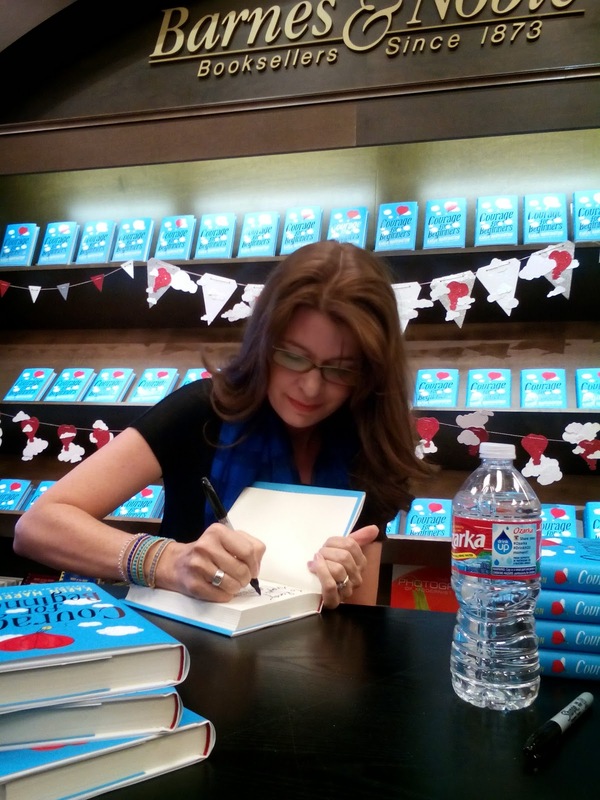 A former newspaper reporter, Blake is drawn toward stories about family dynamics. His personal “Holy Trinity” of authors consists of Anne Tyler, Alice McDermott and Alice Munro, but he reads widely across many genres. Blake published his first novel, Small Change, in 2012. Family secrets are at the heart of Small Change. The Sykowskis, who live in the Chicago suburbs, and the Crandales, from rural Iowa, meet at a Wisconsin lake resort. The two families grow close over the years until a stunning secret threatens to break their bonds. He is working on a second novel, A Prayer for Maura. Blake maintains a fiction writing blog, A New Fiction Writer’s Forum (http://www.cgblake.wordpress.com). By day, Blake is an association management executive for two higher education associations. 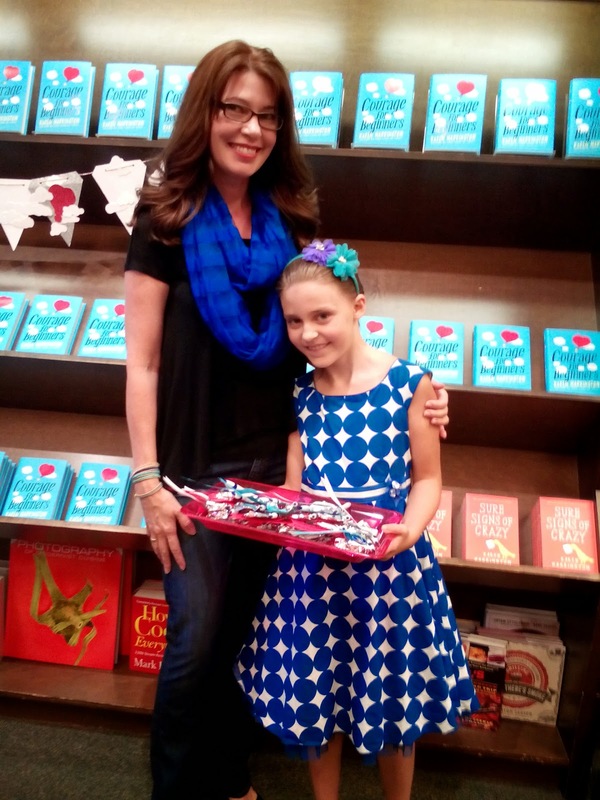 It's always fun to join an author for a book release, and even better when it's someone you know and admire. 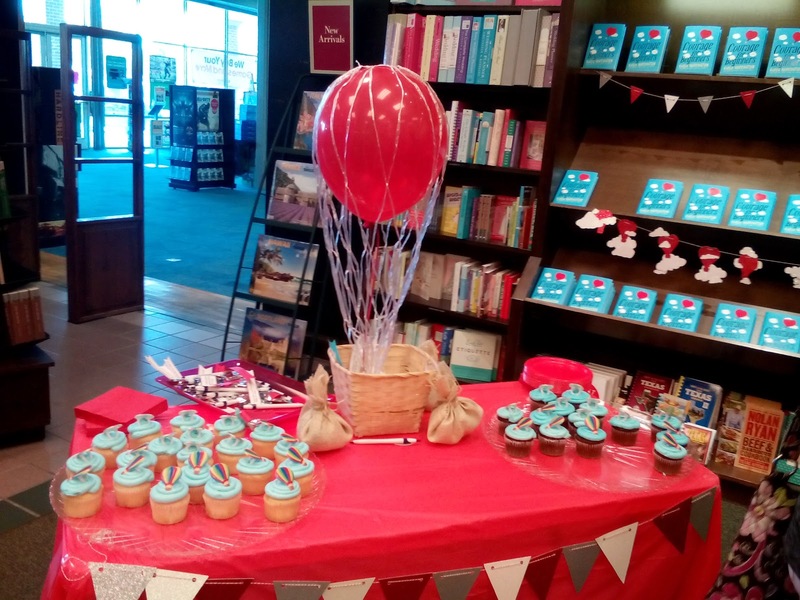 The talented and personable Karen Harrington released her third novel this past weekend, and there was a delightful celebration with family and friends and readers. And cupcakes! How clever is the miniature hot-air balloon that Karen rigged for the release? From the book jacket for Courage for Beginners by Karen Harrington: Mysti Murphy wishes she were a character in a book. If her life were fictional, she'd magically know how to deal with he fact that her best friend, Anibal Gomez, has abandoned her in favor of being a "hipster." She'd be able to take care of everyone when her dad has to spend time in the hospital. And she'd certainly be able to change her family's secret: that her mother never leaves the house. Seventh grade is not turning out the way Mysti had planned. With the help of a hot-air balloon and some unlikely new friends--and maybe even the heroes of the Teas Revolution--can she find the courage to change? 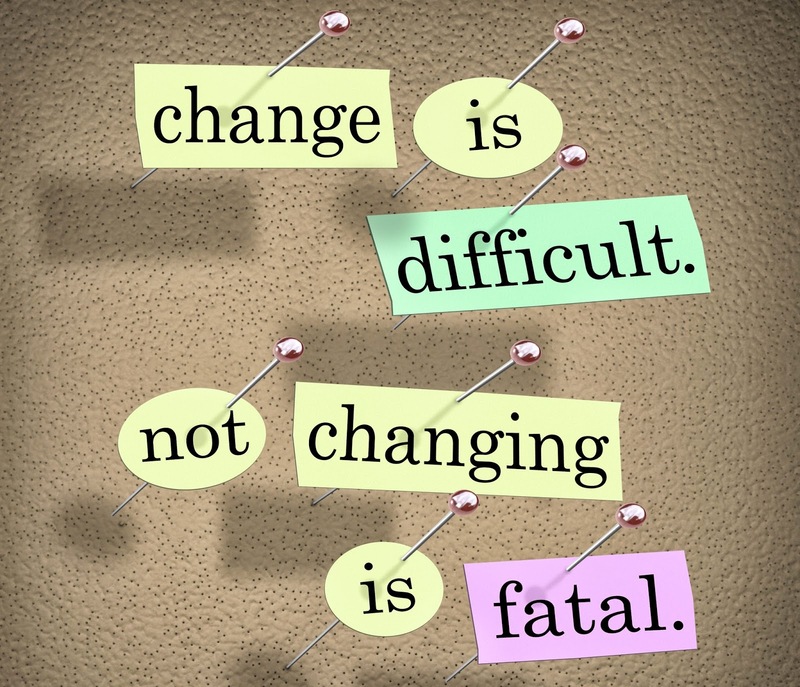 People fear change because it hurts like hell. Even when we know that what is on the other side of the door is better for us-- like losing weight, shedding a vice, or changing a habit-- we still resist. I suppose we can give ourselves a million reasons for not changing a bad situation. And usually, that situation has to hit rock bottom before we make a decision. That's what happened to me this summer, when my mentor at Sewanee asked to see my working outline. It was in complete shambles. I'd changed character names and plot points without noting them. I'd moved chapters around. I'd attempted to track my own word count manually and had failed in the most pitiful of ways. It took me two days of "cleaning" it to even feel as though it were halfway presentable, and by then, on the final day of the conference, it didn't do either of us any good for her to have it. I drove home with a furrowed brow, my thoughts knitted together and forming a tangle bigger than the one I had on the page. My old ways weren't working for me anymore. I realized that because my outline was a mess, in many ways my thought process about the novel was also a cluttered debris field. Now that I'm in my third rewrite (side note: I've stopped using the word draft, because the changes have been too significant at each go-round to constitute mere line edits) I'm realizing something new about my manuscript. It is still unwieldy. My characters still dance off the page when I'm attempting to make then stand still. I have a hard time keeping my own story straight in my mind. And I need a new method of tracking all my changes and research that has gone into this novel. I conducted an informal poll of writing friends and kept returning to the same word of advice: Scrivener. Because I'm in grad school, I saved a few bucks by going with the education license (it is only $45 to begin with, and is $38.25 with the student discount) and then I was on my way to teaching my old-dog self a new trick. I'm still in the throes of learning my new product, but so far, I can see nothing but benefits. It got me thinking: what other tools and technology are out there to help me organize my pages, outlines, and research in a better fashion than what I've been doing before? I found a few, and thought I'd share them with you today. Cliche Finder-- a cool and free tool that will highlight overused words and phrases. The only problem is that it doesn't work on all text samples and frequently gives an error message. But it's free, and it's worth a shot. Find it at cliche.theinfo.org. Byword-- the app is $4.99, but it allows you to write, edit, and sync documents between multiple devices, meaning your can play with your manuscript from your phone, tablet, or laptop with iCloud and Dropbox. Excellent for those on the go. Find it at www.bywordapp.com. Grammarly-- an advanced grammar check site and app. This is tempting, because after I uploaded a twenty page section of my novel it gave me the notifications for more mistakes than I'd like to admit. The only downside? It's $29.95 a month or $139.95 for the year. But if you are a full-time student making too many mistakes to get an A, or if you are a writer at the end of a manuscript who wants a complete scrub of your draft, this may be the perfect tool for you. It's at www.grammarly.com. And my new toy, Scrivener--It was made originally for Mac, but is now available for both Mac and PC. It connects your outline to your scenes and chapters, has space for notes, research files, synopses, and more options and settings than any writer would ever be able to use, at least all at one time. It tracks word count and allows your to set and meet writing goals. The price is worth it, and it comes with an initial 30-day trial. You can find it at www.literatureandlatte.com/scrivener.php. Hello great big amazing world of readers and writers! I am not Elizabeth Lynd! (Insert dramatic gasp here.) But, I haven't kidnapped her or anything. (Relieved sigh here.) Wonderful world of writers, I am her daughter. Codename: Fangirl! Today I will be giving you a treat! (Add excited squeal-y noise here.) I am going to talk about being, as the codename states, a fangirl. I am an avid reader, writer and obsess-er. I prefer the tittle "Fangirl." For those of you who don't know what this is, I will explain. If you Google the term "fangirl," one definition you might get is: An obsessive female fan (usually of movies, comic books, or science fiction). In many senses this is very accurate. In all senses really. You've most likely heard of fanart--if not, it's exactly what it sounds like--and fanfiction. 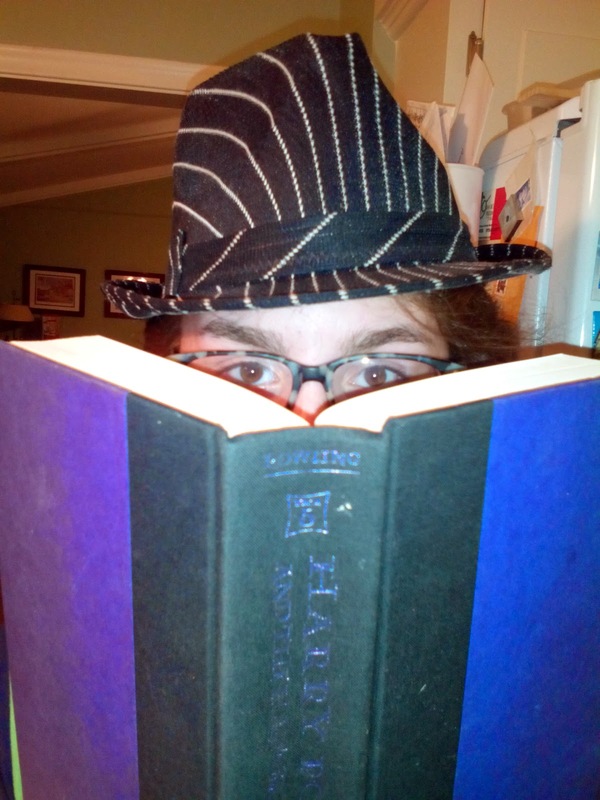 Fanfiction is one of the most common types of writing young writers do today. One simply takes the character(s) of a book and sets up different plots for them. For many young writers, this is their start of writing. Maybe they're not quite ready to tell their story yet. So, they elaborate off another's, practicing, churning ideas for their own books in the future. In many ways, it's a beautiful process many young fangirls go through. 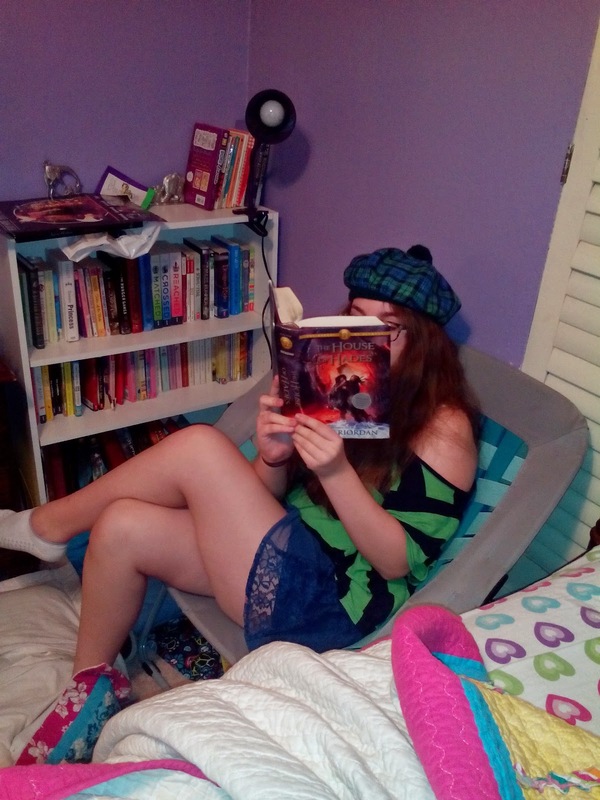 Of course, another thing fangirls do is read. And read. And read. For me, that's the best part of the day. Doing an excessive amount of reading can make one a little bit crazy though. Which explains me. I am crazy about some books. The characters leaping off the pages, the words swirling around me pulling me deep into the book, the places surrounding me as I sit on my trampoline chair in my rather messy room. The things that really pull me into a book stay with me. The things I dislike about a book also stay with me though. Which helps me know exactly what I want to write. Being a teenager, thirteen almost fourteen, many people I've met don't take me as a serious writer. It's not just adults. The biggest naysayers are people my age. But the thing is, I have the same problems that I think all writers have. I can't get motivated to sit down and actually write. I stumble over words, not sure exactly which to use. I get writer's block. I'm busy. My first chapters are always a mess. I keep writing, though, because I enjoy it. I write and so do my friends. We're serious. I want to bring people the pleasure I got while reading the Percy Jackson series. I want to have people experience the awe I felt while reading Harry Potter and the Sorcerer's Stone. I want people to sob ﻿﻿and rejoice the way I was while flipping the pages of To Kill a Mockingbird. I want people to hear the story I have to tell and to feel something. And, that my friends, is the art of being a teenage fangirl. 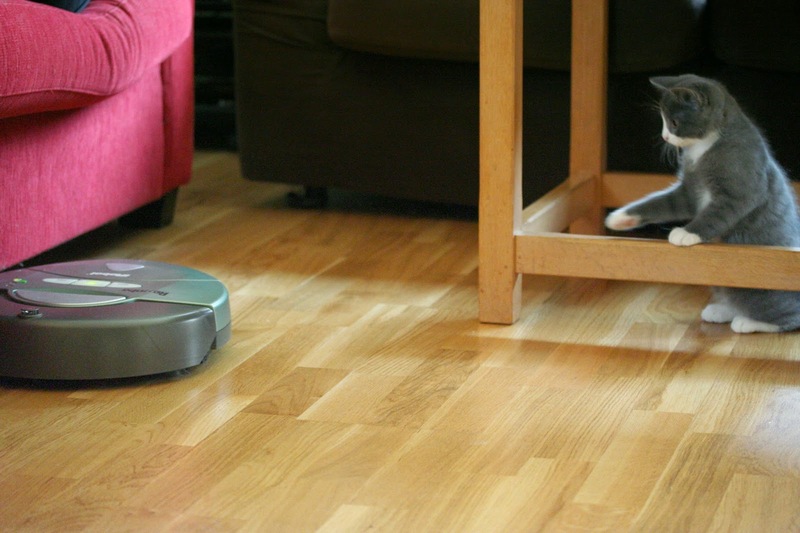 Linus the cat keeps a safe distance from the Roomba. As I write, the TV is on (louder than necessary, I might add--actually, the fact that it's on right now and NO one is watching it is annoying), and I can hear a commercial voice-over telling me that my dishes wash themselves, my clothes wash themselves ... and of course, if I buy a Roomba, my floors will vacuum themselves. Tempting, I suppose, for some but not really for me. Even though I don't wash my clothes in a stream or against a rock, I do sometimes wash dishes by hand. I even like the process of ironing a garment (but don't do it often) and always mix cookie dough with a wooden spoon over my electric mixer. There's something about using my hands and seeing the result of my effort I find extremely fulfilling. I suppose it's true with most writers. But what's also true is that unlike clothes that wash themselves, dishes that wash themselves and floors that vacuum themselves ... books do not write themselves. They take work and effort and planning and plotting and rewriting and editing and more writing. And some of the most effortless reading you'll enjoy, I'll bet resulted from a writer who worked very hard making each word in every sentence just-so. Joan, Elizabeth and I heard Ron Rash read aloud a portion of one of his short stories at a recent signing in Dallas. Lyrical, wonderful, seemingly effortless prose that he later admitted he had rewritten about 30 times. His confession made me think of the short story I wrote during our most recent writing retreat--one that flowed with very little effort. In fact, I was in awe of myself, really. That from start to finish, this piece just came out. So smitten with the result, I immediately submitted it to a contest. Guess what? It didn't place. I made a few edits and sent it off to another one. And, drum roll ... nothing! In hindsight, I can admit I didn't do the work. As much as the story seemed to flow, it didn't write itself. And while it might not need to be written 30 times, I can admit ... it's not quite there yet. Each word in every sentence isn't just-so. Until someone invents a 'Bookba,' a device that will write books all by itself, it's up to each writer to work hard, hone his or her craft, and produce stories worth reading and sharing. Besides, I wouldn't want to read a story that didn't have the heart and soul of a real person invested in it. Those are the stories I want to read. And write. Note: This post is adapted from one I wrote in 2010. It still applies, sadly. 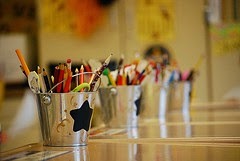 Before school starts each year I compose a letter to my children’s teachers. I try to imagine myself a stranger to my kids and write down anything that it would be helpful for me to know in order to keep them happy and productive for the school year. I’m careful to be honest about their strengths, things I hope they will work on throughout the year, and personality quirks. Invariably Sasha’s teachers offer to let her have assignments early so she can keep up during the Nutcracker and spring performance rehearsal seasons. Ashlyn’s teachers appreciate knowing that she will hold a grudge all year if ever punished because she happened to be near someone talking out of turn. Here is what might be said about me if I were headed into grade 34 this year. Kim will be in your grade 34 class this year and I thought you may find it helpful if I told you a little about her in order to start the school year off right. It has been a disruptive summer with family vacations, dance camps, and a general lack of routine. This has left Kim a bit more distractible than usual and she may have difficulty sitting still. She will not complain if you insist she write 100 words before she can leave her seat. By the end of the day she will likely be on par with the rest of the students as far as word count. Please keep in mind that 100 words on the screen was likely 400 words of actual writing – she’s an extreme perfectionist and a compulsive rewriter. I’m sure with your guidance and patience you can get her relax her standards enough to finish her tasks in a timely manner. If someone wrote a letter to the teacher about you, what would it say? My fellow What Women Write bloggers are not just co-bloggers. They are my critique partners and most importantly, my dear friends. A few weeks ago, I let them know I would soon be taking an extended break from blogging, though I had no intention of taking a break from the other parts of this amazing trifecta. As always, the wonderful women here at What Women Write responded with grace and understanding and are willing to give me this time away, whether short or indefinite. It's my intention to make this time in my life about the main thing -- making the main thing the main thing, so to speak. Of course, my family and the loves of my life are my main thing before any other, but as far as a passion beyond them, writing is my main thing. I plan to work harder at making a writing life than I have before. I am so very fortunate to be published, and published well, and I would like that to be more than just a flash in the pan. In order to do that, I have to find my focus again and keep it there. I have to decide which activities are critical to that path, and which ones are distractions, even if they are worthy distractions on many levels, such as blogging here. It has a been a privilege and a joy for the last five years to post here every other week or so, and I bid you, our dear readers and friends of What Women Write, a very fond adieu for now and wish you all good things. I'll leave you with this video, a song that has been my theme song when it comes to my writing for many years from one of my favorite musicians, David Wilcox. It's time for me to "Run like the river run dry." When I graduated college, many, many suns and moons ago, I interviewed on campus with several accounting firms that were then considered part of the “Big 8.” Because grades had not been my highest priority, my G.P.A. was less than stellar. Not terrible, mind you, but anything less than a 3.5 could barely get one an interview, let alone a job offer. In every interview, I was more nervous than the last. Unprepared, unrehearsed. In front of starched suits and serious mugs, I was feigning a confidence I didn’t have, using a voice I didn’t recognize. Needless to say I was rejected by all of what I considered at the time to be my top choices. I had worked at Swensen’s through most of college and began to think I might be scooping long-term. Why had I worked so hard for my accounting degree? My last on-campus interview was with a large local firm that I had not heard of. Thinking I had nothing to lose, I decided to relax. What’s the worst that could happen? I’d walk away with no job? Big deal. I already didn’t have a job. And so I relaxed. It didn’t hurt that the interviewer greeted me with a warm smile and settled into his chair, unhurried. I decided to be myself. I answered the tough questions honestly and the ones about my grades without embarrassment. I should have asked, what’s the best that could happen? It was at that firm where I learned my work ethic. My stick-to-it-iveness. My determination to not only push through, but to strive for perfection. The work was challenging and I was good at it. I got great reviews, I was promoted. I was with them for over three years, but every accounting job I’ve had since has been because of relationships I developed at that first firm. And so when someone (or that little voice in my head) asks, why am I working so hard at writing? I’ll never get an agent. I’ll never get a publishing deal. I sit back in my chair, unhurried, relaxed, and write. Because I love it. Because I strive for a perfect sentence, and then another. Because I ask myself, what’s the best that could happen? In May, I sat in a Mexican restaurant with my writing friend, Denton during a hellacious thunderstorm. We were just across the Kentucky/Tennessee line at the Cumberland Gap, the place where my ancestors had found their way from Tennessee to Kentucky several hundred years ago. Denton, as well, has many generations of family behind him also firmly rooted to this place. Maybe it's because of this shared heritage that when I'm with Denton, I always speak frankly. "I just want something to stick," I heard myself saying. "This year I decided to apply for everything I could find, and I just want one thing to come through. I'm tired of rejections." Denton nodded. As writers, we'd like to say we're accustomed to rejections, but that doesn't mean we like them. I'd just completed a mad rush of applications, all seemingly due May first. I applied for grants, fellowships, residencies, conferences and workshops. I'd sent work in for contests. I submitted a short story to several journals. "I just want one thing to stick," I'd said. Denton and I had both applied to the Sewanee Writers Conference, and were equally nervous about the idea of rejection. "It never gets easier," he answered, and then it was my time to nod. It got me thinking about how we take rejection, and how that holds us back from moving forward confidently. Do we give up after a few rejections, or do we not submit at all out of the mere thought of a rejection? What holds us back from putting our work out there? Why apply? Why set yourself up for rejection? Here are a few things to keep in mind for those of you reluctant to put your work, or yourself, out there, on why to apply. No one is directing your writing career except for you. Think about it: There are no daily time clocks, no managers, and no co-workers when you are writing alone. You are the only one in charge of both your writing time and your submissions and queries. Manage your writing career as you would any other. Put in the time, do the work, then apply and submit. If you don't, who will? Conferences and workshops can help your writing, and your writing career. In conferences, you can work with some incredible faculty, and the quality of work from your peers is exceptional. Not only can you make new friends and mentors, but conferences swarm with agents and editors looking for quality work. How can this hurt you? I can't think of a single way. Beyond that, You'll made some amazing new friends, and the experience can enriched both your writing and your life. Contests and publications can raise your profile. Your platform is your body of work, and only that. A social media presence is just a presence. When talking to agents and editors, they care far more about your platform than your presence. And the more quality awards and publications you have on your resume, the better. It certainly can't hurt. Will you get rejections? Most certainly. But when that one thing sticks, it can change your career in so many ways. And sometimes you can be surprised. The payoffs far outweigh the rejections. For Denton and me? We were both accepted to Sewanee, and are just now finishing a tremendous near-two weeks at this inspiring conference. We could have both been rejected, and we would have moved on. Instead, because we stuck our necks out and took a tiny risk, we've just shared a week that's made us better writers, better connected, and closer friends.